Following an informative, concise and well written introduction, Leslie Hoppe leads the reader through an insightful and serious study of the book of Isaiah, first of the major prophets. Weaving a way among the oracles of judgment and salvation, Hoppe demonstrates how key themes of "the Holy One of Israel" and "Daughter Jerusalem" establish a foundation for the reading of this book of sixty-six chapters. Readers of this commentary will find an enriching analysis of this masterpiece of prophetic literature. Leslie Hoppe, O.F.M., has written a clear and appealing commentary on the book of Isaiah for the Collegeville Study Guide. He explains historical background of each of the three parts of Isaiah, points out resonant language in the text, and shows how Isaiah seeks to persuade its readers to live as God's people in the thick of complex political and historical events. In Hoppe's hands, Isaiah's concern for the poor emerges as a prominent theme of the book, while Isaiah's message to live righteously never skips over the call to justice. Hoppe's invitation to readers resembles Isaiah's. How shall contemporary communities of faith live as the new Jerusalem? This study guide is for people interested in the prophets, in the church's ample liturgical use of Isaiah, and in enhancing their own spiritual lives. In keeping with the most recent scholarship, Leslie Hoppe focuses here on the present canonical book of Isaiah, highlighting, through references forward and backward, recurring literary images and theological themes (especially God as the Holy One of Israel, and the role of Jerusalem). In addition he looks at its past and the historical, political, economic, and religious contexts to which it spoke, as well as to its future and the role it would play in both the Christian context (e.g., its abundant use in the New Testament) and later Jewish life. While brief, this commentary combines historical exegesis, literary sensitivity, and an actualization of its religious meaning for us today. 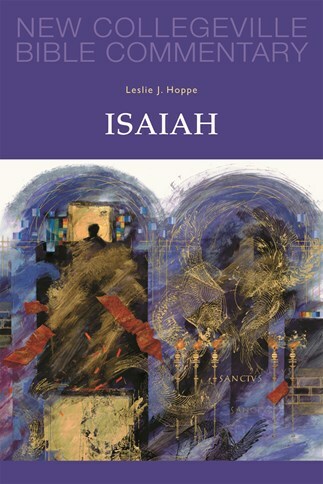 Leslie Hoppe's commentary on Isaiah emphasizes the unifying themes, and the resonance of Isaiah's prophecies in the New Testament. It is clear, concise and reliable. An excellent introduction for church groups. This commentary is a delight to read. Hoppe's clear prose provides the best biblical scholarship by someone who knows the historical context of Israel's monarchy in format that is perfectly aimed for an educated lay audience. The way that he provides insight into current archaeological and historical research breaks open the images in Isaiah's poetic material. In addition, the connections that the author makes with New Testament texts that resonate with the images taken from Isaiah make the book of Isaiah relevant for the modern church-goer.